The Bahamas Silver Knights did the impossible on August 10th at the London Olympics to upset the mighty USA in the 4x400m men's relay. The team was comprised of Chris Brown, Demetrius Pinder, Michael Matthieu, and Ramon Miller. The time was a new Bahamian National record of 3:56.7 2 . At the Beijing Olympic Games, t he team of Andretti Bain, Mathieu, Andrae Williams, and Brown finished with the Silver medal in a time of 2:58.03. The old record was 2:57.32 in winning the Silver medal at the Helsinki World Championships in 2005. On that team were Nathaniel McKinney, Chris Brown, Avard Moncur, and Andrae Williams. The London time places The Bahamas in eleventh place in the All Time performances, and in third place behind The United States and Great Britain as a nation. The USA holds the World record at 2:54.29 done on the 22nd of August, 1993 on the day of double World Junior Gold medalist Anthonique Strachan’s birth . That was at the Stuttgart World Championships with Andre Valmon, Quincy Watts, Harry “Butch” Reynolds, and Michael Johnson . Great Britain clocked 2:56.60 to win the Silver medal at the Atlanta Olympics in 1996 and Jamaica ran 2:56.75 for Silver at the Athens World Championships in 1997. We thought we would provide a history of the evolution of the “Golden Boys” event for track and field fans to see just how far we have come. In the 1954 British Empire and Commonwealth Games in Vancouver, the first time The Bahamas participated in international Track & Field, Cyril “Peepsight” Johnson ran 51.8sec and Irrington “Rinky” Isaacs ran 54.3sec in their heats. Some fifty-five years ago this month the team of Ulric Whyly, Hubert Dean, George Shannon, and Oscar Francis won the Bronze medal in the 4x400m relay in a time of 3:35 .2. F our years later the Pioneers Sporting Club ran 3:30.0 to win the Empire Day meet, May 24 th , 1961. This was some thirty three and a quarter seconds less than the present record. Even our women’s record is faster than 3:30.0. On that Pioneer team fifty one years ago were Winston “Gus ” Cooper, Hugh Bullard, Kirk Knowles, and Julian Brown. Both Bullard and Brown had attended the 1960 Olympic Games in Rome, while they were students of St. John’s College. Bullard ran the 400m in 51.8sec and Brown was unable to participate since he fell ill. That March Bullard, the speedster, and Brown, the eight hundred meter star ran the fastest 400m race ever witnessed in The Bahamas at that time . At St. Augustine’s College track Brown clocked 49.9sec, the first time that a sub fifty second race had ever been done in The Bahamas. Bullard crawled over the line to finish the race. Fast forward seventeen years to Medellin, Colombia at the 1978 Central American and Caribbean Games. A team of Rudy Levarity, Steve Hanna, Rickey Moxey, and Andre Newbold clocked 3:10.52 for a new Bahamian N ational record. Steve Hanna was a Long and Triple Jumper who was quite versatile, Andre Newbold was a basketball player at R.M. Bailey who came over to Track & Field and became an eight hundred and four hundred metre specialist. Moxey and Levarity were the country’s top sprinters at the time . At the Central American and Caribbean Senior Championships in Havana in 1983 a team of Allan Ingraham, Joey Wells, Greg Rolle, and David Charlton clocked 3:07.06 to win the Silver medal. I t took another ten years for another breakthrough in this event. Sidney Cartwright, head of the Bahamas Tigers concentrated on this event. His club, The Bahamas Tigers had athletes like Dennis Darling, Troy McIntosh and Tim Munnings , who had started the 400m after participating in a Community meet. In 1995 at the IAAF World Championships in Gothenburg, Sweden, Troy McIntosh (46.1sec), Dennis Darling (45.6sec), Tim Munnings (46.51sec) and, Carl Oliver (45.65sec) ran 3:02.85 to place sixth in the semi-final . Carl Oliver from North Andros had attended college at the University of Wisconsin, Parkside and joined the Bahamas squad. In Jun e of 1996 Troy McIntosh smashed Mike Sand’s national record of 45.20sec in the 400m with a 44.73sec clocking in Mexico City. This was definitely a turning point in the Bahamian 400m and subsequently the 4x400m relay. Sand’s time was done some twenty-one years prior at the NCAA Championships in Provo, Utah in June of 1975. Their time was improved to 3:02.17 in the Atlanta semi-final with Carl Oliver running 47.28sec, Troy McIntosh 44.90sec, Dennis Darling 45.28sec, and Tim Munnings 45.25sec. 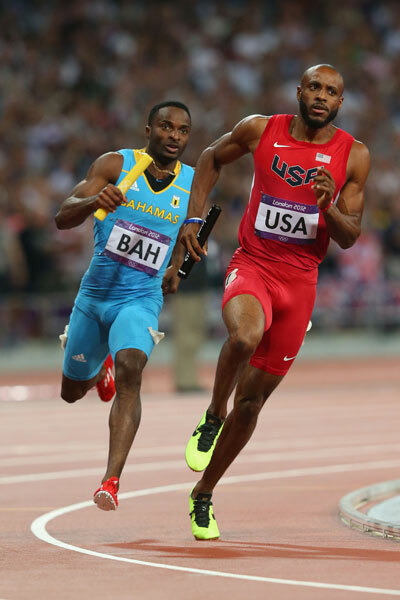 Due to Nigeria being disqualified in the semi, The Bahamas advanced to the final where they ran 3:02.71 for seventh. At the Central American and Caribbean Games in Maracaibo, Venezuela, Troy McIntosh became the first Bahamian to capture the 400m in the Games with a 44.84sec clocking. The Bahamas team of Avard Moncur, Carl Oliver, Chris Brown, and Dennis Darling won their first CAC Games medal, finishing in third place in 3:04.16. Later in 1998 McIntosh won the Bronze medal in the 400m at the IAAF World Cup in Johannesburg in 45.45sec.The next year he finished in fourth place in the World Indoor Championships in Maebashi, Japan in 46.05sec, just three hundredths of a second out of the Bronze medal. In 1999 Avard Moncur won the NCAA Championships 400m. He decided not to compete in the Seville World Championships, going back to Auburn University early. The team of Tim Munnings(46.5sec), Troy McIntosh(45.6sec), Carl Oliver(46.01sec), and Chris Brown(44.64sec) finished in seventh place in Seville in 3:02.74. Moncur defended his NCAA title in 2000. At the 2000 Sydney Olympic Games the team of Avard Moncur, Troy McIntosh , Carl Oliver, and Chris Brown ran 2:59.2 3 for fourth, behind The USA, Jamaica, and Nigeria. Due to doping infractions by the USA the Bahamas moved up to the Bronze medal. They had run 2:5 9 .02 in the semi-final. I n Edmonton, Canada, on August 12th, 2001, The Bahamas finished second with a 2:58.19 clocking. The splits were Moncur-45.1sec, Brown-44.6 sec , McIntosh-44.42sec, and Munnings-44.13sec. Based upon more doping infractions by the USA, The Bahamas was given the 2001 World Championships Gold medal. At the 2003 World Championships in Paris The Bahamas team of Avard Moncur, Dennis Darling, Nathaniel McKinney, and Chris Brown finished in fourth place in 3:00.53sec. One more time, due to doping violations, The Bahamas was moved up, this time to Bronze. At the Athens Games the team of Nathaniel McKinney, Aaron Cleare, Andrae Williams, and Chris Brown finished in sixth place in 3:01.88. Controversy was involved when Coach Sidney Cartwright dropped Dennis Darling from the team because he refused to run the lead-off leg. Aaron Cleare replaced Darling. At the 2005 World Championships in Helsinki, the team of Nathaniel McKinney, Avard Moncur, Andre Williams, and Chris Brown finished in second place with a new Bahamian National record of 2:57.32. Troy McIntosh ran in the semi-finals. In 2007 at th e IAAF World Championships in Osaka The Silver Knights won the Silver medal one more time, this time withMoncur, Mathieu, Andrae Williams, and Brown clocking 2:59.18. For the first time ever two Bahamian athletes achieved the final in the 400m of either the World Championships or Olympic Games. Brown finished fourth in 44.45sec and Moncur finished in eighth place in 45.40sec . Two years later in Berlin the team of Ramon Miller, Avard Moncur, Latoy Williams, and Nathaniel McKinney won their Semi-Final heat but were disqualified for stepping out of the exchange zone at the start of the race. Latoy Williams out of Grand Bahama had run the best time in the world in the 400m in early April of 2009. Few people associated with Track & Field in The Bahamas had ever heard of him then. The team was hoping to salvage their disqualification in Daegu, South Korea in 2011. The Bahamas finished fourth in the Semi-Final and was out of the competition. Ramon Miller, Avard Moncur, Andrae Williams, and LaToy Williams ran with a time of 3:01.54. They needed to finish with one of the top eight times. Kenya finished in third place with a clocking of 3:00.97. The federation experienced much castigation for not running Pinder and Brown in the Semi-Final round . A t the IAAF World Indoor Championships in March in Istanbul, Turkey, last March, Pinder finished with the Silver medal and Brown with the Bronze medal. This was the first time that this had ever happened in the BAAA history with two athletes winning a medal in the same event at the IAAF or Olympic level . On Friday, August 10th , the fifty-fifth anniversary of the Bahamas’ first ever medal in international Track& Field competition, Tommy Robinson’s Bronze in the 100m at the West Indian Federation Games in Kingston, Our Silver Knights discovered what they always knew w as possible! Our Men’s 4x400m Relay Team has been tried, castigated, and come up heroes. It is our belief that we can go much further. The Bank of The Bahamas put their money on the line when they gave the team $10,000 as an incentive for their performance in London. The team will be tested in Moscow next year at the World Championships, in Beijing in 2015 at the World Championships before the Rio Olympics. It is hoped that The matchup of The Trinidad & Tobago Team with teams from The Dominican Republic, Jamaica, and Venezuela next July at the Sr. Central American and Caribbean Championships will be something that regional track fans will look forward to. In between there is the IAAF Inaugural World Relays in 2014 on home turf in Nassau. 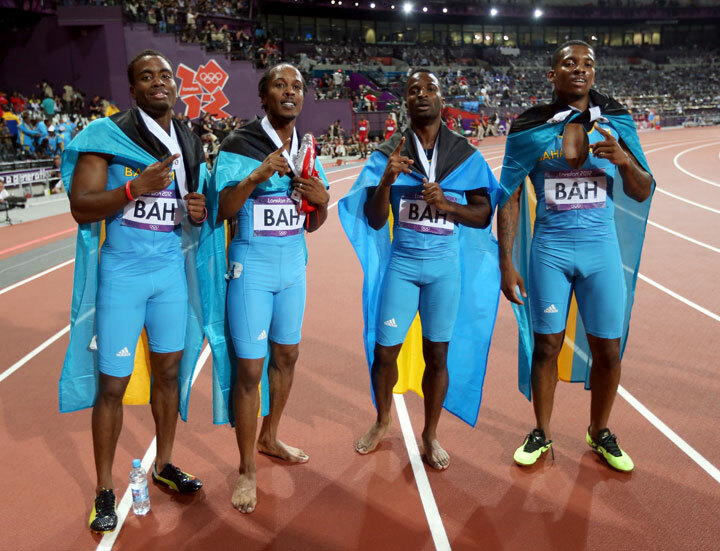 Many more Bahamian men will gravitate to the 400m than they did in the past because of the achievement of our Golden Boys on Friday, August 10 th , 2012. Bahamians showed an unbelievable sense of National Pride and non Bahamians showed their appreciation for being here after the exploits of “ Our Golden Boys ”. In the meanwhile it is hoped that more Bahamians develop a positive view of our athletes as they “ Discover What’s Possible ” as the Silver Knights did. “Discover What’s Possible” is a Scotiabank Slogan. Thanks goes out to BTC and Scotiabank for the BAAA Olympic Trials, to BTC and other sponsors for the London Olympic Team, and to The Ministry of Youth, Sports & Culture. Special thanks goes out to the coaches. Extra Thanks goes out to our Track & Field fans.